Cat Ba island is the largest island within Vietnam's famous Halong Bay. It is the only place for people to overnight while visiting Vietnam's most famous body of water. No other island has hotels, so if you want to overnight in Halong Bay then this is the island to stay on. But, nothing can compare to sleeping in a nice room .... on a boat in the middle of Halong Bay. It is the best and most memorable way to see this wonder of nature. Just hope for lightning during the evening. It's an incredible sight, especially if you book into one of the thin, bamboo shacks along Cat Thien Beach. Cat Ba is located 50 km East of Hai Phong city in the North of Vietnam. The island is a member of the 366 islands that lie within Halong Bay. The island has very deep hillsides that give way to lush agricultural valleys that are as green as the rolling hills of Scotland. The mountains all around are draped with thick layers of cascading vegetation. The island is just a huge rock so the beaches are at the end of a cut section of the rock. It looks like they cut the beach entrances out of the rock so that they appear like driveways that slowly descends into the sea. The waves are funneled between the rocks and the beaches are filled with small bamboo huts. Cat Ba island is a place that is ideal for backpackers and other budget tourists. But it will not remain that way for long. This year (2018), I saw a once pristine place become more littered than ever before. The problem does not yet detract from the beauty of Halong Bay. I'm just spoiled because I first visited in 2001, when there were very few tourists. Where is Cat Ba Island? The island is located in Halong Bay in Northern Vietnam. Halong bay is 133KM from Hanoi and 30KM East of the city of Haiphong. Which of the Cat Ba Hotels to Stay in? Remember that you should decide what kind of person you are before choosing one of the Cat Ba hotels. If you stay in the cheap bamboo huts on Cat Thien Beach then you will be very exposed to the elements. The rain will get you wet and the wind will sneak through the paper-thin walls of your hut. This is my kinda place, though. If you stay in one of the Bamboo Huts then you'll hear the ocean lapping over the beach and if the lightning comes during the night, the view will make you glad you're alive. If that is not to your taste, then there are many other budget to medium Cat Ba hotels available on the island. A great place to stay is at the Sunrise Hotel in Cat Ba. The rooms are nice with great sea views and you can hear the waves crashing over the hotel's private beach. The hotel is also very close to the nightlife of Cat Ba Island in case you are so inclined. I went mountain biking on Cat Ba Island. Afterwards, I felt like I'd finally had my first taste of the real Vietnam and the way the people had traditionally lived. But it was a hard ride. I am a fairly young guy and I was hurting after that ride. And we took the ride slow, often stopping for a rest along the trail. I would not recommend this specific tour for the elderly or the handicapped. Having said that, I've seen some old guys that could ride circles around me and some handicapped people that brought along their own souped-up mountain bikes. Ask at any of the Cat Ba hotels or travel agents for info on mountain biking tours. Next we headed to Ben Beo Harbor on Cat Ba. Ben Beo Harbor is the largest Bay on the Island. There are also over 300 small to tiny islets that are part of Cat Ba. Ask at any of the Cat Ba hotels or travel agents for a boat to take you out. Thien Long Cave is a long, bat - infested cave. It is filled with huge stalagmites and stalactites that most local people take to represent lions, tigers and bears. Ya it's there and everyone will tell you about the great wildlife you'll see. And they will be so rare that you will see none of them. The hike up is a good workout as the humidity will steal all your power. Once you get to the top of the trail though Cat Ba National Park, you'll get some nice views but the 20 minute hike is not easy. All of the best aspects of both Halong Bay and Cat Ba will be explored if you get on one of the worthwhile budget tours through Halong Bay. You can do either the overnight cruise on a Traditional Junk Boat or do a 3 day tour so you sleep on the boat while moored in the center of Halong Bay...Gorgeous! 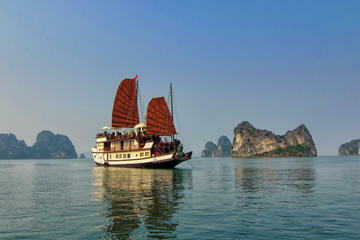 Get more information on the Halong Bay Overnight Junk Boat Cruise or the Halong Bay 3-Day Junk Boat Cruise. The trip from Hanoi to Cat Ba takes just over 3 hours in total. First, you'll have to get to Hai Phong. Buses leave from Luong Yen Bus Station in Hanoi several times a day for about $12USD - $15USD (2018), depending on where you get your ticket. From Hai Phong you can see the jagged profile of Cat Ba Island. It is just thirty kilometers away but the ferry ride takes a full three hours. The 'Hydrofoil' ferries from Hai Phong to Cat Ba leave at 8:00AM, 8:30AM, and 9:00AM. To get over to Cat Ba on the same day, you'll have to be on the 5:15AM bus from Hanoi or you'll have to overnight in Hai Phong. If you get the regular ferry from Binh Port in Hai Phong then you can catch the 1:30PM departure. There are more and more options for getting to Cat Ba everyday.